Open Source as ALTernative is a directory of software that is organized in form of matching open source and closed source apps by function. 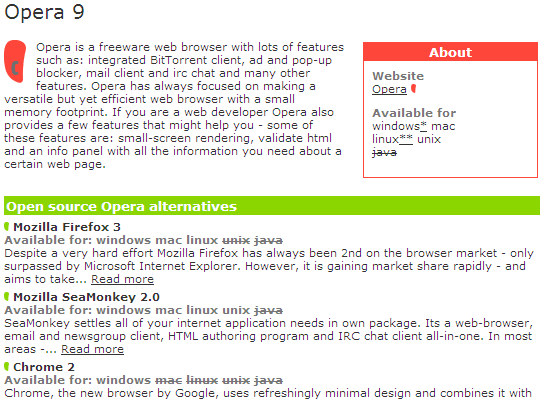 It aims to provide just as functional, but open source alternatives to common software. Site list software by category and in every there is two sections – open source and not. For every app there is profile page with brief description, relevant links and alternative software titles. Many sources of information on software (blogs, ahem) revolve around of iceberg top – hyped software for bulk of casual users. osalt is more comprehensive – it properly lists software that rarely makes news and of more interested to developers and power users. Another good point (and it saddens me that this made into good points) is that sites doesn’t force open source down your throat. It is site for convinced people, not to convince people. Version information (and possibly other) is horribly outdated. It seems that new software is being added to directory, but there is no effort to maintain older entries. I think it woul be better to not bother with versions at all than display outdated information. I also have an issue with core idea of the site formulated as grandstanding of commercial software to open source with is great communities. Frankly plenty (and all of large projects) of open source is very commercial in nature. And I highly doubt great communities, that is generalization at best (and wishful thinking at worst :). Probably simply bad choice of words, but it does contribute to rough unpolished character of the site. Good place to look for specific app, bad place for generic research.